I refer to the article (“Dirty reality behind solar power”, September 10) and the subsequent clarification (September 16). It was asserted that the energy produced from burning coal directly is more than the energy generated by a polysilicon solar panel manufactured by using the same amount of coal. This way of comparing different methods of electricity generation is incomplete as it does not compute the carbon footprints of the two methods of electricity generation. A more commonly accepted way of making such comparisons among the international science community is to make reference to the life cycle of CO2 emissions of different electricity generation systems. This is known as the life cycle inventory analysis. The technical details are contained in the note entitled “Carbon footprint of electricity generation” published by Britain’s Parliamentary Office of Science and Technology. Carbon footprint is defined as “the total amount of CO2 and other greenhouse gases emitted over the full life cycle of a process or product, expressed as grams of CO2 equivalent per kilowatt hour of generation”. All electricity generation technologies emit CO2 at some point during their life cycle. None are entirely carbon free. However, according to the “life cycle inventory analysis”, published in October 2006, the conventional coal combustion electricity generation system in Britain had the largest carbon footprint, more than 15 times that of a solar energy electricity generation system (the British photovoltaic, PV, power systems using crystalline silicon). Furthermore, the carbon footprint of PV cells would be reduced with thin-film technologies using less silicon and other new semi-conducting materials. Different thin-film PV technologies are active areas of applied research supported by the Innovation and Technology Commission, conducted at the Nanotechnology and Advanced Materials Research and Development Centre in Hong Kong. 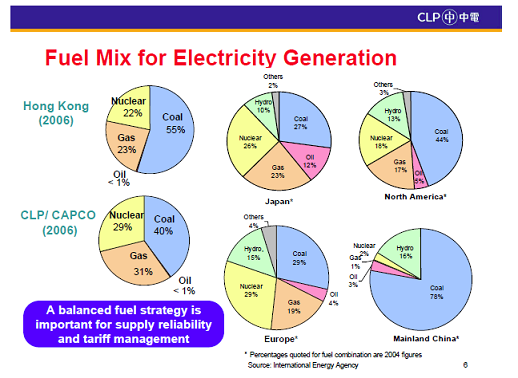 Cheaper electricity is projected after the Executive Council today approved CLP Power’s contract extension for the supply of electricity from Daya Bay Nuclear Power Station for another 20 years from May 7, 2014. 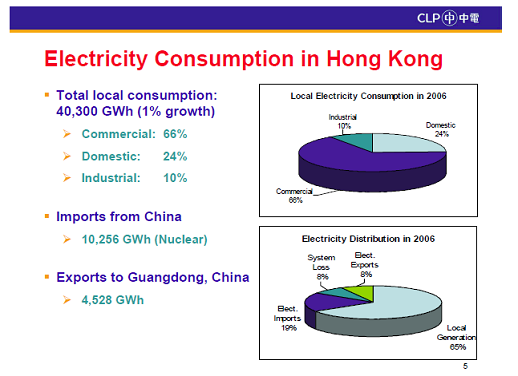 The projected average unit price of nuclear electricity from Daya Bay is expected to fall up to 12% under the deal. The Memorandum of Understanding on Energy Co-operation signed between the Government and the National Energy Administration last August saw the backing of the 20-year extension. The supply quantity will be no less than the current level in principle while pricing will be agreed on commercial principles. Secretary for the Environment Edward Yau said the extension will benefit both consumers and the environment. A beaming Tony Blair posed for television cameras holding a sleek, shiny solar panel as smiling officials and film star Jet Li looked on. They announced an ambitious plan to bring modern, clean power to the world’s poor. In the next five years, the programme would bring solar-powered street lamps to 1,000 villages in China, India and Africa, where people are so poor they still do not generate any of the greenhouse gases blamed for global warming. The plan was announced at a factory in Guizhou in southwestern China – one of its poorest provinces. But would Blair, the former British prime minister, and Li have been smiling if they had known a factory must burn more than 40kg of coal to produce the panel – one metre by 1.5 metres – they were holding? Forty kilograms might not sound much. But even the country’s least efficient coal-fired power plant would generate 130 kilowatt-hours of electricity burning that amount – enough power to keep a 22 watt LED light bulb beaming 12 hours a day for 30 years. A solar panel is designed to last just 20 years. Jian Shuisheng , a professor of optical technology at Beijing Jiaotong University, estimates it takes 10kg of polysilicon to produce a solar panel with a capacity of one kilowatt – just enough to generate the energy to keep a fridge cool for a day. To make that much polysilicon on the mainland would require the burning of more than two tonnes of coal. That amount of coal could generate enough electricity to keep the fridge running for two decades. Like Blair and Li, many consumers, as well as corporations, in developed countries are buying mainland-made solar panels in the belief that using them will help slow the pace of global warming. Demand for solar panels has risen rapidly in the past few years, creating a US$100-billion-a-year market for panels and related industrial materials. Five years ago, mainland production of polysilicon – the key component of solar panels – was negligible. Today, it is the world’s leading producer of the material, and last year churned out 4,000 tonnes – 80 times as much as in 2004. This year the government expects output to soar to 30,000 tonnes and projects that by 2011 it will reach a jaw-dropping 150,000 tonnes. At least 16 provinces began building 33 polysilicon production plants last year, newspaper the 21st Century Economy Review has reported. But far from saving the world, the production of solar panels is aggravating pollution and adding to energy consumption. Mainland government officials have known this for years, but not until the global economic crisis made a big dent in demand for solar panels did they openly admit that the “green business” could be dirty sometimes – and seek to regulate the market. Such hasty expansion is not confined to the production of solar panels. From installing wind power to the production of vehicles running on alternative fuels, bubbles exist throughout the new-energy sector. Senior officials at the National Development and Reform Commission, the key economic ministry, have spoken many times of the need for higher entry barriers – from curbs on bank lending to more frequent environmental checks – to prevent firms and local governments rushing into the sector and avoid overexpansion. But their warnings went unheeded: many provinces are already building some of the world’s biggest solar power projects. And they will not stop, because they have invested more than 100 billion yuan (HK$114 billion) in the projects. Polysilicon is greyish, crystallised pure silicon; more than 90 per cent of solar panels on the market contain it. Dr Dang Qingde , deputy head of the department of labour safety of the Centre for Disease Control in the city of Leshan in Sichuan , measured the amount of toxic chemicals in the air at a polysilicon plant in September 2007. Leshan is one of a handful of cities to have imported polysilicon production lines from overseas. The plant in the city is capable of producing 1,500 tonnes of polysilicon a year. The factory is clean and quiet. Grass and trees grow between its buildings. Using a hand-held device, Dang found more than 10 poisonous substances – from ammonia, the effects of which are relatively mild, to the lung-eating trichlorosilane – but all at levels within the safe limits decreed by Beijing. Nevertheless, he wrote a report in which he rated the workplace “highly hazardous”. “A shiny polysilicon plant is like a shiny bomb. It may look clean and innocent, but you don’t want to have one in your neighbourhood,” he said. What made Dang nervous was the presence of chlorine. The chemical is used at almost every stage of the manufacturing process. Chlorine can not only turn your blood into hydrochloric acid, but also interact with other chemicals – such as silicon – to form more deadly poisons, he found. Dang published his findings in an academic journal, despite opposition from the plant’s management, in the hope it would draw the attention of others to the environmental issues in polysilicon production. “I have prayed for heaven’s blessing to save our workers and residents in the neighbourhood,” he said. Since the first polysilicon factory opened in Leshan, more have followed. Now it is one of the biggest polysilicon production centres on the mainland. Output rose by more than 300 per cent in two years. To Dang’s relief, this has not led to calamity. Still, that is not the case elsewhere. Emissions from the Huafu Silicon Company’s plant in Liancheng county, in the southeastern province of Fujian , polluted the air and water in a village, causing violent clashes with farmers. The company says the pollution was accidental. There will be more such cases because mainland factories are using old-fashioned, energy intensive and highly polluting equipment, says Jian, the Beijing Jiaotong University professor, who is a member of the Chinese Academy of Sciences. Extracting pure silicon is a tedious business, the professor said. In the 1950s, engineers at German engineering giant Siemens discovered that by putting hydrogen, chlorine and raw silicon in an oven and heating them up until they vaporised, they could get rid of some unwanted chemical elements. They repeated the process until they got 99.9999999 per cent pure polysilicon – just pure enough to make solar panels. Half a century later, most of the polysilicon makers in the world still use this method. The professor described what happened to the polysilicon after that. A very fine length of wire is used to slice a block of polysilicon into very thin pieces. But they are not yet thin enough. The polysilicon sheets are sanded down until they are 200 micrometres thick – a process that turns 40 per cent of the polysilicon into waste that cannot be recycled. According to Jian’s calculations, almost 30 million tonnes of coal, or more than 1 per cent of the mainland’s output of coal last year, will be needed to keep the ovens of all the polysilicon plants hot. With production expanding and demand falling, the price of polysilicon is collapsing. A kilogram sold for US$350 last year; this year the price has dropped to US$70 – barely enough for the factories to pay their power bills. Faced with the prospect of the mainland’s polysilicon industry collapsing, Premier Wen Jiabao issued an urgent order two weeks ago for production capacity to be reduced. But most people in the industry think this action has come too late. People’s Daily published a story last week about a plan to build Asia’s biggest solar power plant in Yunnan province . It will have a capacity of 166 megawatts. If two tonnes of coal is needed to produce a one-kilowatt solar panel, how big will the plant’s carbon footprint be?